HGS Technologies provides Social Media marketing for your brand promotion and business promotion. 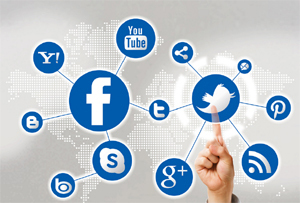 Social media marketing is mainly used for business peoples. Social media marketing like online advertisement so that it will reach all over countries. Social media is used to allow people to communicate with one another. Smart marketers quickly realized they could use social media to leverage their brand. No other marketing platform offers the potential reach that social media does. With over a billion users on Facebook and hundreds of millions on other platforms, it’s no surprise that companies are spending a lot of time developing social media strategies that work. Social media marketing can help enable your business to engage with customers, build your brand, participate in business networking, meet new clients and suppliers, drive quality traffic to your website and ultimately increase your sales.